Industry Leaders. 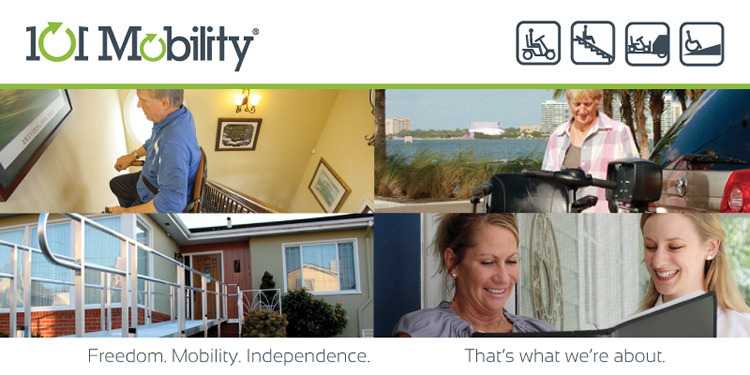 101 Mobility is the leading brand in the mobility and accessibility industry. Our Franchise Owners operate within a trillion dollar industry. The growth potential is phenomenal. Scalable Business. It's not just talk. 87% of our owners have been successful enough to grow their business into something bigger. Fact. Unrivaled Pricing. 101 Mobility Owners enjoy exclusive relationships with the leading product manufactuers. This makes it difficult for anyone to compete with us. A Business That Matters. This is the most important thing to understand. 101 Mobility Franchise Owners love getting out of bed and going to work, because they get to solve serious and real problems with seniors in their community. You have to WANT to help your community in order to enjoy the full experience of a 101 Mobility Owner. Headquartered in Wilmington, North Carolina, we provide and install a wide range of high-quality mobility equipment. Thousands of elderly customers and others with disabilities count on us for our exceptional products, which include stair lifts, auto lifts, wheelchair ramps, porch lifts, power wheelchairs, and more. As a nationally recognized brand, 101 Mobility is proud to be one of the largest dealers of our mobility product manufacturers. More and more Baby Boomers are becoming senior citizens with each passing day. And as they age, so do their mobility and accessibility needs. 101 Mobility saw an opportunity to become a professional, reliable, and trustworthy resource, standing out from the rest. 101 Mobility offers the opportunity to secure a future that is both professionally and personally rewarding. As one of the largest dealers of mobility solutions and with a sales force covering multiple states across the country, we are on the move and seeking motivated entrepreneurs who can help us reach our goals. In exchange for your dedication to the 101 Mobility franchise program, you will receive access to our detailed business system, best-in-class mobility products, comprehensive training sessions, the latest in business technologies, and more to help you grow your franchise business. Comprehensive, corporate-based training that covers critical business functions sales, marketing, installations, and a full set of online ongoing training tools. Onsite startup assistance and periodic field visits from a corporate representative. A copy of our confidential operation manual to help your operations run effectively and efficiently. Established relationships with mobility equipment vendors, the VA, and core national accounts. Guidance with ordering initial equipment and supplies as well as samples and demonstration units from manufacturers. Assistance with in-territory marketing and public relation campaigns. Presence on our highly visible website. Access to our proprietary Mobilink™ software which provides assistance with scheduling, customer management, quotes, inventory, and more. 101 Mobility is currently accepting inquiries from the following states: Alabama, Alaska, Arizona, Arkansas, California, Colorado, Connecticut, Delaware, Florida, Georgia, Hawaii, Idaho, Illinois, Indiana, Iowa, Kansas, Kentucky, Louisiana, Maine, Maryland, Massachusetts, Michigan, Minnesota, Mississippi, Missouri, Montana, Nebraska, Nevada, New Hampshire, New Jersey, New Mexico, New York, North Carolina, North Dakota, Ohio, Oklahoma, Oregon, Pennsylvania, Rhode Island, South Carolina, South Dakota, Tennessee, Texas, Utah, Vermont, Virginia, Washington, Washington, D.C., West Virginia, Wisconsin, Wyoming.